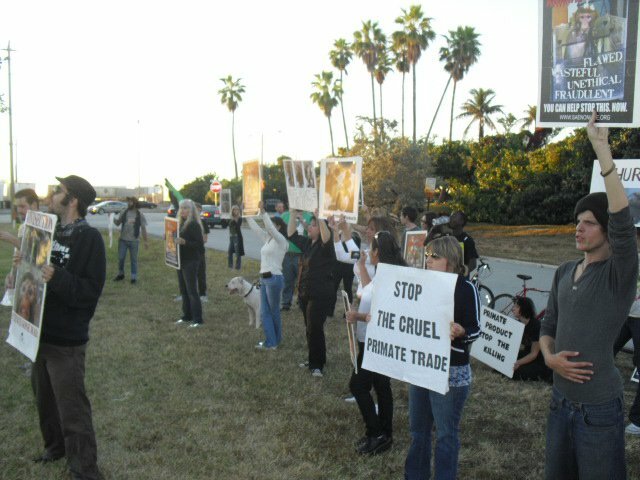 On December 17th, in solidarity with the Lab Animal Transport Global Day of Action, three dozen protesters gathered outside the headquarters of Amerijet International. This company has merited world-wide scorn for its unethical and inexcusable involvement in the cruel primate trade. As evidenced in a recent expose, Amerijet has violated the lax Animal Welfare Act at least thirteen times in the last three years. Their unfortunate victims have suffered inadequate ventilation and food and water deprivation, to name just two of the shocking realities of this vile cargo company. Obviously, Bassett, Amerijet, and HIG Capital will sink to crime in order to try to make an extra buck. Shame on all of them! Protesters, filled with righteous rage, chanted their message so all could hear. Pitiful images of mutilated monkeys were shown to Amerijet customers and employees alike. How can someone with a conscience look and still do nothing? One activist was arrested and held in jail for 20 hours. His charge was for wearing a mask on public property. The arrest was well timed. For at just that moment, David Bassett, president and CEO of Amerijet, tried to slink out of the building. But his sliminess did not go unnoticed. Dozens of passionate activists suggested he cut the company’s ties to the vivisection industry. Bassett, what will you do? Will you make the ethical choice and stop the monkey flights or stain your company with the blood of your innocent primate victims? If you choose the latter, crowds of protesters will haunt your headquarters as a constant reminder of those defenseless animals you choose to kill. It is disgusting that the greed for money outweighs the desire for morality. Amerijet You can have protesters arrested for nothing to try and divert attention off you for a brief second. However don't think for one minute we have forgotten or lost sight of who the true criminals are. Amerijet, since you have yet to do what is right, we will be here to remind you that the livs of these innocent animals are worthy and they are NOT "products" to ship ! We will serve as your conscience and your "hired help" will never intimidate us, as the only ones we answer to are the animals. Stop the transport, do whats right. One of the customers of Amerijet was just the topic of a NBC TV news story. Those same monkeys Primate Products claimed to take back at no cost for "retirement" in fact were going to be killed and instead were sent to some road side zoo that didn't have proper cages or knowledge to care for them. Many died. Even after the first group was dying, Primate Products had no issue with sending a second group to their deaths! Amerijet don’t think that for one moment we will stop protesting, you just fueled our fire. The arrest of one of the protesters was uncalled for and unjust. Bassett you have the power to stop the transport of these innocent animals and therefore put an end to the mental suffering, agony, misery and torture. These animals die an awful painful death. We will stand together strong until these awful criminal acts stop. AMERIJET PLEASE STOP THE TRANSPORTATION OF PRIMATES!!! Don't you see what you're doing is WRONG? Or do you see it and not care that you kill some of these beautiful creatures on the way to become tortured, abused slaves time after time? Where is your compassion, man??? Is the money from Primate Products and vivisection in general more important? You'd rather line your pockets with bloood money than do the right thing and break all ties with the vivisection community? Do your children or grandchildren know what happens to these primates you deliver? If nothing else, think about them! Some of you MUST be wondering if this torture and death is really worth it. You HAVE to be. I can't believe all of you have no concience. Prove to the world that you're DONE with Primate Products and contributing to vivisection! Step up to the plate Mr. Bassett, Amerijet. 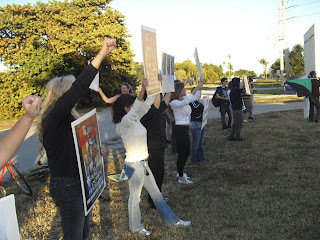 Be a major part of ending vivisection! there is never any excuse or justification for animal cruelty and abuse. our moral and ethical calling is to protect these animals and bring about a more just and humane world for them. for those who claim to be "religious", all the great religions of the world call out to us as humans to nurture and protect the Earth and all its creatures. they are not ours to own, barter, torture or kill. it is their intrinsic right to live, free from our destruction. our calling is very strong. we will not relent, we will not be dissuaded, we will not be stopped until amerijet, primate products and all those "companies" who deal in and profit by the torture, misery and death of animals no longer exist. what a disgusting company Amerijet ,why is it so hard for you to do the right thing? for the little profit you receive from transporting these defenceless animals to hell,shame on you! I hope that Amerijet contemplates the repercussions of their actions, decisions and what they participate in. Abuse, misery, agony, suffering, cruelty, sadistic pain inflicted on live beings that feel a range of emotions and sensations just as we do…on and on and on. PLEASE STOP transporting primates to cruel, cold labs where they live a living hell AMERIJET!!! Don't you feel anything, Bassett, when you look at the mutilated monkeys? You must have ice in your veins to continue this abuse. TORTURER!! What kind of crap is this to give away monkeys to their deaths. These people at Primate Products have no shame and they obviously care at all what happens to animals entrusted into their care. I hope this gets them another investigation and maybe they won't white wash this one.